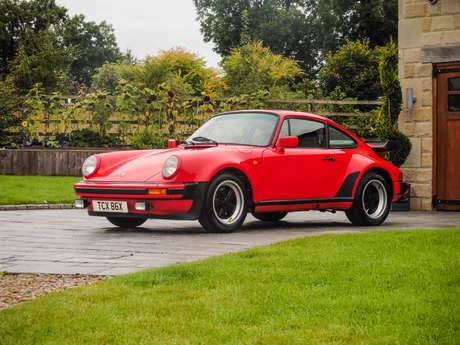 Arguably one of the finest examples of the iconic eighties Porsche 911 (930) Turbo goes under the hammer at the Silverstone Classic Sale on 29th – 30th July. The meticulously restored multiple award-winning Porsche will be one of the highlights of the two day auction which forms part of the world’s biggest classic motor racing festival, the Silverstone Classic, where over 100,000 visitors are expected. With a pre-sale estimate of £125,000 to £145,000, the Porsche is one of a growing line-up of ‘Best of Breed’ classic cars for Silverstone Auctions’ sale of the year. One of the first to be consigned, the car won awards for its restoration by the Porsche Classic Restoration Centre in Leeds, a project that was completed in six months netting the team at the JCT600 workshops the “Porsche Cars GB Employee’s Choice” and “Best Mechanical Restoration” accolades in 2014. Full accounts of the restoration were published in several Porsche and classic motoring magazines and a book specially commissioned by JCT600, copies of which are included with the detailed history file. The car has covered just 200 miles since further post-restoration work by renowned Porsche specialists Tech 9 Motorsport. The base car for the restoration was a sadly neglected UK right-hand drive 1981 930 Turbo discovered in a Leeds garage. The iconic eighties supercar had been gathering dust for 15 years and required a full strip-down and nut-and-bolt restoration. The project was part of a competition between every Porsche Centre in the UK, judged by 1970 Le Mans 24 Hour winner Richard Attwood. Now resplendent in authentic Guards Red, what started out as a challenging car in a state of extreme disrepair, ended up as a beautiful, immaculate example of a car that took the eighties by storm. In addition to a chemical strip and bead-blasting of the bodywork, the brakes and running gear were subjected to detailed restoration and the engine benefitted from a full mechanical strip, repair and rebuild. As many of the original parts as possible were retained, such as the aluminium crank cases and rocker covers, but the turbocharger and wastegate were sadly beyond repair and were replaced with new parts.